St. Kuriakose Elias Chavara was born on 10th February 1805 at Kainakary, Kerala. At the age of 5, he began his studies in a village school, called Kalari. When he was 13, he joined the seminary at Pallipuram for his priestly training. While he was in the seminary, his parents and his elder brother died of an epidemic. On 29th November 1829, he became a priest. 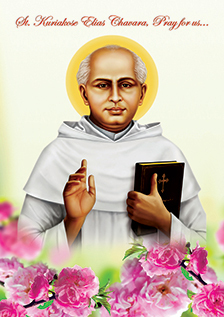 St. Chavara was instrumental in founding two Catholic religious congregations – one for men, Carmelites of Mary Immaculate (CMI) and the other for women, Congregation of Mother of Carmel (CMC), for the spiritual renewal and all round development of the society. Starting seven ashrams and a convent in different parts of Kerala, Chavara initiated a spiritual movement among the people of Kerala. He established the first Catholic Sanskrit School, a major seminary and a printing and publishing house at Mannanam. He directed that every church should start a school attached to it and encouraged children even poorer section to attend that schools by supplying mid day meal and dress for them. He founded a home of charity to take care of the destitute beggars, the uncared sick and the old. Even in the midst of such manifold activities, he found time to write several literary and spiritual books in prose as well as verse. Among them, 'Anastasyaude Rakthasakshyam' is the first narrative poem and 'Nalagamangal' the chronicle of history in Malayalam. He knew seven languages-Malayalam, Tamil, Sansktrit, Syriac, Latin, Italian and Portuguese. Essentially St. Chavara was a man of prayer and great charity. He lived for 65 years and died on 3rd January 1871. His Sanctity was officially recognized by the church, when Pope Francis declared him 'Saint on Nov 23, 2014. Saint Chavara is the heavenly patron of all CMI institutions. Let us pray to him to intercede before God for all our needs, especially for success in our studies.